How many of the homeless here in affluent State College will be dead by midnight Christmas Day? This photograph should tell you all you need to know. All the rest is merely commentary. I took this photograph less than an hour ago. A homeless man is bundled over a cup of coffee as the wind chill factor is 27 degrees F and scattered flakes of snow are beginning to fall. Four blocks away a brand new multi-story Hyatt has gone up where on premium football weekends a single room costs $450 a night. 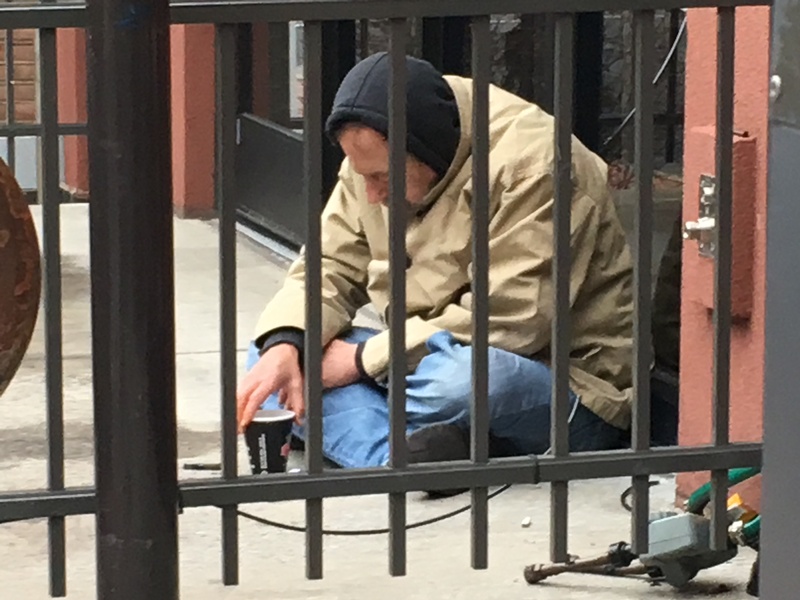 As the Manhattanization of Downtown State College progresses with abandon, it is no surprise that this month—just in time for Christmas—less than three blocks away one of this community’s homeless shelters shut down. The temperature is dropping rapidly. Will this man be dead by midnight when Santa Claus begins his rounds determining who has been naughty or nice?